This is my kinda lunch. 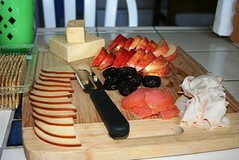 I have some flatbread crackers, sliced smoked gouda, pepper jack, dubliner, sliced apples, smoked turkey, smoked salmon and prunes. I know- gross. But I’m getting old, plus I just like the way they taste- everyone needs more fiber! 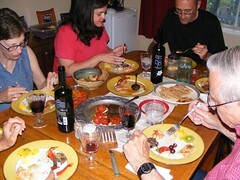 During the Cavalcade of Fun, we had a tapas party. This was really fun and everyone loved the food and the fun of the many dishes. You can do it however you’d like. I tried to make most of the foods compliment each other. As the appetizer we had some yummy chipotle cheddar cheese, for the tapas we had a good variety; seared tuna, buffalo shrimp, hummus, roasted red and yellow peppers, caprese salad, fresh seasonal fruit and of course wine. We sat at the table and laughed and ate and drank and had just a great time as the cavalcade of fun drew to another close and Mimi and Devin headed back across country. As it turns out they are even farther away, though still in Colorado, but I am not going to figure out the mileage and change the blog name, its close enough. So – for a while our food blogs will again be separate, divided by two time zones and a lot of miles, but still together at heart. I love soup. Especially potato soup. The last few potato soup recipes I’ve tried have left me flat. So when I checked out the “New Recipes from Moosewood Restaurant” book from the library, I was hesitant to try the potato soup recipe. Luckily, I threw caution to the wind and tried it anyway, and I’m so glad I did. In a large soup pot, saute the onions and garlic in the butter until the onions are translucent. Add the potatoes, carrots and celery and saute for 5 to 10 minutes longer. Add the stock or water (or wine) and dill and simmer until all the vegetables are tender. Puree the veggies with the cream cheese and milk in a blender or food processor. Return the soup to the pot. Season with salt and pepper. Stir in the cheddar cheese and reheat gently. Serve each cup or bowl garnished with parsley. Have I mentioned lately how much I love weekend breakfasts? I’m sure I have. Most of my posts seem to be about weekend breakfast. Dev and I went to Sante Fe and Albequerque this weekend, so Sunday was the only day I cooked. I had a ton of veggies left in the fridge from the harvest at the greenhouse last weekend, and I needed to use everything up fast (We are headed out again Tuesday to go to Montrose til Sunday). 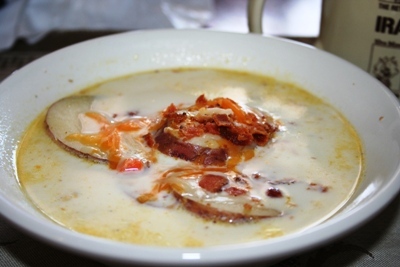 I have posted about rostis before. I have found these to be a great way to clean out the refrigerator. Basically it’s a big potato pancake with whatever you want on the top, shoved under the broiler til it’s a big hunk of melty cheesy love. Here’s a link to my original rosti post. 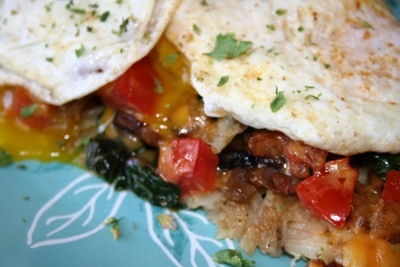 This time around I used bacon, onion, swiss chard, mushrooms and tomatoes, topped with cheddar cheese. Because Dev doesn’t like fried eggs, I topped his with scrambled eggs when it came out from under the broiler. I, on the other hand, am a runny yolk person, so I topped mine with a couple of fried eggs. There’s something about the yolk that helps emulsify the whole dish. Anyway, as usual, these were to die for. When Dev and I retire and have all the time in the world, I might just make these during the week, too. But right now, he’ll have to suffer through crappy weekday breakfasts to get to the decent weekend stuff. This recipe is an old southern one from a book called (appropriately enough) “Southern Cooking.” The author of the cookbook, Lorine Olliff Hendricks, is from Metter, GA. The book is pretty entertaining, and includes recipes for possum and squirrel- I would say that’s pretty authentic. I was looking for a potato soup recipe (cuz I didn’t have any possum or squirrel laying around) and found one on page 5. But it did the trick and warmed everyone up, so it wasn’t a complete loss. 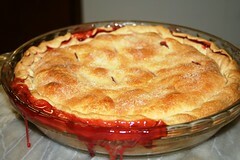 This was my second attempt at a rhubarb pie, and the result was every bit as scrumptiuous as the first! This time I used strawberry instead of raspberry, and I cheated and used a store bought crust. But the results were amazing. You are looking at the very first ever batch of flour tortillas I’ve ever made. They came out pretty well. I think next time I will sub whole wheat for some of the flour, and I will definitely add some herbs to the dough. Put flour, shortening and salt in a mixer and beat with the paddle attachment until crumbly. The recipe said it would take 3-5 minutes, but it didn’t take that long for mine. With the mixer running, slowly add the water and mix until the dough is smooth. Take the dough out of the mixer and shape into small balls. Mine were like golf ball sized, but the resulting tortillas were small. If you want bigger tortillas, make the balls bigger. I think it is mostly trial and error. Put the dough balls on a tray and cover with a damp cloth. Let them sit at least 15 minutes. On a lightly floured board (I actually used 2 pieces of parchment paper on a silicone mat) roll dough balls into discs. 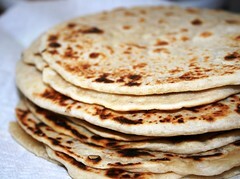 Mine were pretty thin, and most made 6 inch (or thereabouts) tortillas. Heat a cast iron skillet on medium high heat. Make sure it is very hot before you put in the dough. Cook tortillas one at a time, about 30 seconds per side, but you will know when they are ready to flip because they will get bubbles in them and start lifting off the skillet bottom. But keep an eye on them- they go from pleasantly charred to unedible in about 2 seconds! The article I read said they can be frozen after they are cooked. Layer them in ziplock bags between wax paper or parchment paper sheets. Mine are bound for some red curry paste-marinated chicken pieces with greek yogurt sauce. I will try to remember to post a pic of the wraps before we dig in!